Leisure & Tourism is one of our key areas of expertise, so we are thrilled to announce that we’ve taken on another major client in the industry this month. 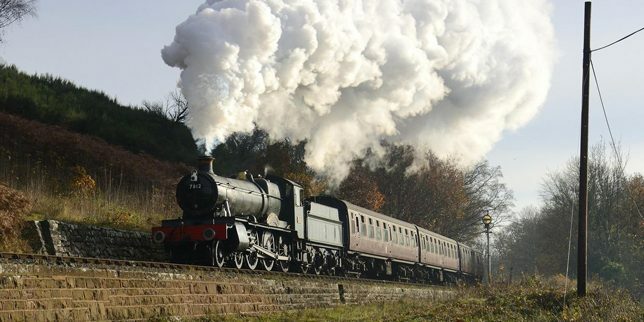 Severn Valley Railway is one of the oldest and best known heritage railways in the UK and a popular day out for families and steam train enthusiasts. They have a big education programme that encourages children to step back in time and learn about World War II, evacuation, the science of steam, local history, nature and more! We’ll be working with them to design the brochure that gets sent to schools to promote their education offering for 2018. We’ve expanded our healthcare portfolio this month. We’re proud to have worked with major providers such as Spire Healthcare in the past, giving us the expertise needed to support two new clients with marketing and design projects. We’ll be working with Cambridge-based Milton Chiropractic Clinic to help them develop a brand for a new treatment method they’ve developed. This will include a new logo and branding as well as copywriting for their website and promotional materials. Then, once they’re ready to launch, we’ll be designing an online marketing campaign to help them raise awareness. We’ve also been supporting NPP Neuro Group by refreshing some of their marketing materials. Our in-house printers are a real benefit to clients who want to explore different printing options, as it means we can produce samples quickly using their artwork so they can get a feel for how it will look, instead of just seeing the options on screen. We were excited to welcome a VIP to the studio a couple of weeks ago when Pudsey bear came in for a photoshoot. The team at Enterprise Rent A Car booked our photography studio, which is conveniently located close to their head office, for a photoshoot with members of their senior management team, and of course Pudsey himself! Our studio is a flexible space available to hire by the hour or day, equipped with everything you need – all you need to bring is your camera. We’ve had children, pets, families and newborns in before, but this was our first bear…and celebrity appearance! We love receiving parcels at Studio B61, especially when they include a chance to see our finished designs in action! Last month we were working on designs for a book cover for Fen Flack’s sequel to last year’s book ‘Ironside’. We designed the cover for her debut novel last year, with the help of illustrator Bhavin Mistry, and were delighted to be asked to help with book 2 which went to print last month. Fen kindly sent us a copy so we could see the finished design in action, and it looks great next to book 1! Last month we designed the concept and visuals for new driveway banners to go up at HMP Hewell. We’re working with the prison as a strategic communications partner, helping them improve their employer brand. There’s a long driveway leading up to the prison, which is the perfect opportunity to start introducing people to the core values and culture of the organisation as they approach. We wrote slogans and created a visual design for 15 banners and arranged for the printing and fitting to make sure they look great and meet health and safety standards too. It’s great to see them up in action! When you need a new photo of your team or some corporate headshots, sometimes it’s easier for the photographer to come to you. We’ve got a range of portable studio lights and backdrops, so it was easy for us to set up a temporary studio in the boardroom at Harris Lamb’s Birmingham office to get some new photos for them this month. Expo season is here again and a lot of our clients are out and about exhibiting, which means we’ve been extra busy getting them ready! First up was Malcolm Scott Consultants, who exhibited at Birmingham Glee at the start of the month – showcasing their offering to help garden centres increase their income and maximise their catering and retail spaces. We designed the banners for their stand to fit with their garden theme, designed & printed their handouts, flyers and brochures and designed and sent their pre-show email campaign to encourage people to visit them on the day. Expos are a great way to get your products and services in front of an audience who are actively looking for what you have to offer – so planning them properly is essential to make sure you get maximum return on investment. Hannah has been working with clients for several years to help them make sure they stand out at expos. We provide a full range of expo services to help you prepare, stand out and excel on the day and turn as many leads into sales after the show. Our clients Shire UK were also exhibiting this month, showcasing their innovative foundation systems at the Asset Management Show in Birmingham. We also provided a full service, including banners, flyers, brochures and and managing their pre-show email campaign. The banners for their stand were 8m x 3m, broken into 10 modular panels. That’s the biggest expo system we’ve designed to date, but they looked really eye-catching once they were in place! It sounds like the expo was a big success for them – one visitor said “Seeing this here today has made the 3 hour journey worthwhile”. We’ve also been designing new banners for Titania, which will be winging their way to America for Infosec North America in Boston next month! We’re looking forward to see our design work state-side. At Studio B61 we think it’s important to help the local community wherever you can, so we were pleased to be able to lend our design skills and print services to St Pauls Hostel – a local organisation dedicated to helping homeless people. They reached out through #WorcestershireHour – another great local partnership thanks to this great Twitter chat! CEO Jonathan tweeted us to say how chuffed he was with the business cards and that he was really pleased with our service – something we’re always pleased to hear. If you’d like to know more about St Pauls Hostel, follow them on Twitter. They’re looking for volunteers to help out at the hostel, and also for donations of several items. Visit their website to find out more about how you can help. It’s only September but we also launched Arley Arboretum’s spooky Halloween events on social media this month and designed the first Christmas advert of the season for them!